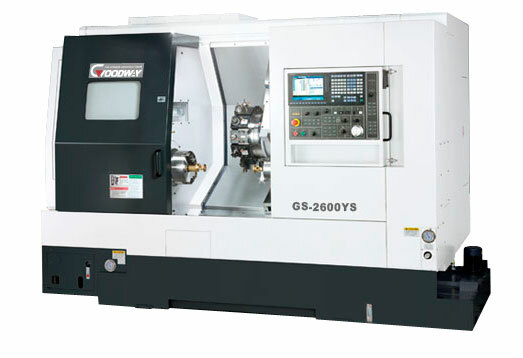 Packed with industry leading technology and top quality compoonents, the GOODWAY GS-2000 series turning centers combined incredible power, strength, and speed to bring you The Ultimate Machining Power ®. These powerful maximum performance machines will easily accopmlish the demanding turning applications of today and tomorrow. Furthermore, with available live tooling ( 2 options available ), C-axis, Y-axis, and sub-spindle capabilities; milling, drilling, and front / back-end turning applications may be completed in one single machine. *1.Individual models may vary, please see "Specifications" page. *1 : Ⅰ : Built-in type motor live tooling turret with ER40 rotary toolholder. Ⅱ : GS-200 series live tooling turret with ER32 rotary toolholden. *4 : Specifications are subject to change without notice.